All of our dogs and puppies have been tested for heartworm and parasites (and treated, if needed). They are also on heartworm preventative. Our adoption fee includes those tests, flea preventative, all age-appropriate shots and are already spay/neutered. Please understand the statements about this animal are based upon the foster evaluation of the dog. The animal might behave differently (negatively or positively) in your home. While the animal might be good with the current foster’s dogs, cats, children, etc. it may not be with your animal(s) or children. The animal may be housebroken or litter trained in the home of the foster but my relapse in your home. The animal is represented to the public as it performs in the foster home and any statements made regarding the animal are conditional to that foster home setting. These interested in adopting should have read all information about the animal and understand they cannot claim they did not understand the facts about this animal as understood by Planned Pethood and/or the foster. Planned Pethood and vet(s) do our best to provide accurate age and breed of the animal, but sometimes they are educated guesses. Please understand that statements made regarding this animal are simply overviews and are not guaranteed. Your adoption fee is non-refundable for any reason. Click on the "More Info" button at the bottom of the pet's picture you are interested in. This will provide you with each pet's detailed adoption information. Click on the "Add to Cart" button and it will take you directly to the Adoption Application. If you have problems filling in the application, try a desktop device. Another option is to download a PDF version (Adobe Acrobat required). A Microsoft Word version is also available. You can scan and email the completed application to pets@plannedpethood.org or bring it to one of our Saturday adoption events. If you would like to adopt more than one pet, you only have to send in one application. Just send an email to pets@plannedpethood.org and let us know which pet your original application was for and what other dogs you are interested in. Thank you for your interest in a rescue dog! 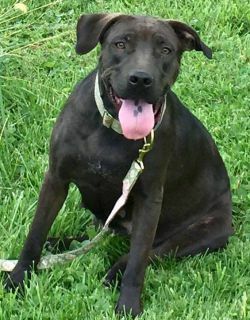 Polly (Molly Polly) is a four year old female lab/pittie mix. She is a beautiful girl who loves to play. She is working on appropriate play with her people as she tends to get a little mouthy. She is full of energy and will require lots of exercise and daily walks. She is currently recovering from ACL surgery so 3 walks daily is a must as it is part of her rehab. She is house trained and crate trained. She enjoys her snuggle time with her people almost as much as her play time. She is a dominant dog and is dog selective so it’s best that she is the only dog in the household or she meet any resident dog. She is still learning her manners so she needs a forever home with teenaged children and/or adults. If you are interested in this fun, lovable girl, please fill out an application. Special Notes: Polly has a special adoption fee of $75. Note: Please understand the statements about this animal are based upon the foster home's evaluation of the animal. The animal might behave differently (negatively or positively) in your home. While the animal might be good with the current foster’s dogs, cats, children, etc., it may not be with your animal(s) or children. The animal may be housebroken or litter trained in the home of the foster but may relapse in your home. The animal is represented to the public as it performs in the foster home and any statements made regarding the animal are conditional to that foster home setting. Those interested in adopting should have read all information about the animal and understand they cannot claim they did not understand the facts about this animal as understood by Planned Pethood and/or the foster. Planned Pethood and vet(s) do our best to provide accurate age and breed of the animal, but sometimes they are educated guesses. Please understand that statements made regarding this animal are simply overviews and are not guaranteed. Your adoption fee is non-refundable for any reason.